We saw Leatherface return in 2013's thoroughly enjoyable Texas Chainsaw 3D, and four years on the chainsaw wielder returns in prequel, Leatherface. French horror maestros, Julien Maury and Alexandre Bustillo, step behind the director's chair - an undeniably exciting concept. We hope they'll blend their French extremist style with pulpy Southern Gothic aesthetics. In Leatherface, Jessica Madsen plays one of four inmates (Sam Coleman, Sam Strike, James Bloor) who escapes from a mental hospital. One of them becomes the title character and iconic slasher. The quartet kidnaps a young nurse (played by Vanessa Grasse) and takes her on a road trip from hell. 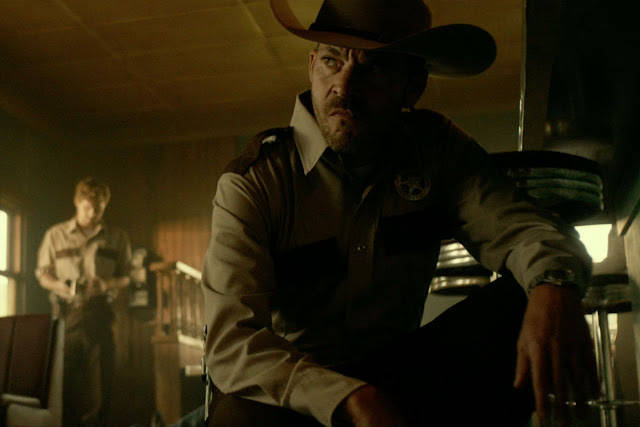 Along the way, they are pursued by an equally deranged lawman (Stephen Dorff) out for revenge. The Conjuring‘s Lili Taylor is Verna Sawyer. Not content with simply thrilling us with their choice of directors, Lionsgate also casts two genre favourites in Stephen Dorff and Lili Taylor. Leatherface will see an exclusive DirecTV release on September 21, 2017, with a limited theatrical run and full VOD on October 20, 2017.